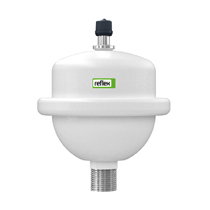 Refix diaphragm expansion vessels are ideal for potable water and service water systems as well as for specific applications in closed water systems. All water-carrying parts are protected against corrosion, and the water is stored in bladders. Refix DD is the potable water specialist for the home and is ideal for using with water heaters to save water. 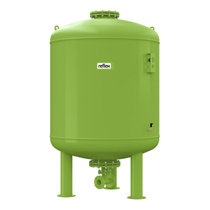 Water flows through the vessel, it has a stainless steel connection and thereby meets the ultra-exacting hygiene requirements of DIN 1988. The T-piece required is supplied with the unit and the Flowjet fl owthrough valve is optionally available. The basis of a low-cost solution for potable water, water heating & hydro-pneumatic well applications. Water does not flow through this vessel. 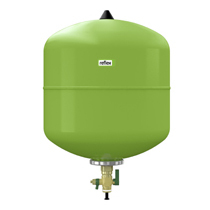 The DE range is fi tted with a bladder, which can be replaced from 50 liters on, and is ideal for use in water systems with higher corrosion resistance requirements, as suitable for brine circuits in heat pump systems. Refix HW has been developed for domestic water systems. It has legs for standing on the fl oor and a bracket for the fitting of a booster pump. 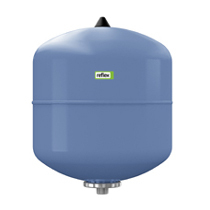 Refix DT is the potable water specialist for use with large-scale systems. 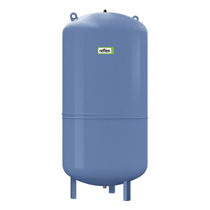 Water flows through the vessel, thereby meeting the ultra-exacting hygiene requirements of DIN 1988. The wide range of different connections enables the Refix DT to be adapted to any capacity. 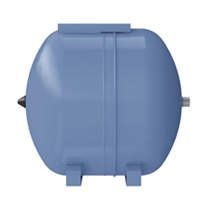 Identical in contruction with the DE-series, with the only difference that a diaphragm is used with DC vessels. Refix water shock arrestors are neither expansion vessels nor buffer vessels but are designed specifi cally to absorb water shocks in water pipes up to 1/2". They are ideal for fi tting upstream of washing machines, dishwashers or combined heating appliances.